Cell size from 1/25 inch to 2 inch; thickness from 0.02mm to 0.1mm; depth from 2mm to150mm, shape:rectangle,triangle,rhombus,trapezoid. Chemical finish: Electrophoresed,Alodine. 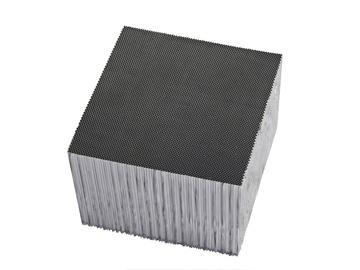 Because of its excellent performance,aluminum honeycomb core is widely used in eletronic and industrial field.Such as Crystal lattice for electric heater,Laser-beam cutter panel for textile machine,network for trafical guidance light,separator for illumination,guidance for water and gas purification,cooling agent carrier for air conditioner,refrigerator and air purification,and also being screen printing panel,shielding screen,heat insulation screen and so on.